I didn't want to let this slide until it was old news, so I don't have a lot of details yet, but.... 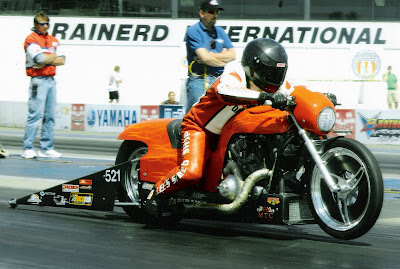 The Pro Gas winner at the AMRA season opener in Bowling Green Kentucky last weekend was my friend Joe Lieske on his big inch V-Rod nick named "The Disruptor." Joe and "The Disruptor" in fine form - two years ago! Despite rain on Friday and unseasonably cold the remainder of the weekend, Joe managed to qualify in the #3 position. Not too shabby since Joe spent the entire last season chasing gremlins and didn't have a single opportunity to take the bike down the track with the big motor in it (though he did make a few passes with a stock Destroyer engine installed just to see if he could stand to go that slow). Of course after qualifying was over, Joe remembered something he had noticed two years ago, switched his gearing , and ran quicker in eliminations than the #1 qualifying time. From there it was smooth sailing to the win in the finals. Cool. Congratulations Joe, and here's wishing you a successful 2011 season! As is so often the case this time of year, it seems there is no free time for writing. I have been porting heads like a madman ....well, let me clarify; like a madman in respect to volume - not in respect to quality! On top of that the Donnie Smith Bike Show is this weekend. The show is a pretty big event, to put it mildly. 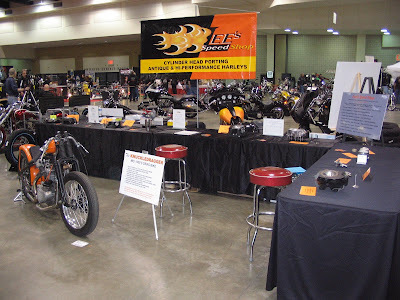 It consists of 160,000 square feet on three levels containing 200 world class show bikes plus nearly 1000 vendors either selling or promoting their wares. It also happens to be the one venue outside of the Internet where I promote my business each year. Though the show doesn't open to the public until Saturday at 9am, for me it begins on Thursday, because Neil, the show's promoter, is a long time friend. For that reason I help both Thursday and Friday with load in, usually directing bike show participants and vendors to their assigned spaces. Late Friday evening, I will finally get a chance to set up my own display, consisting primarily of examples of heads which I have ported. This year I added a display for a new service that I offer: machining for Automatic Compression Release valves in Twin Cam heads. So, if it happens that you will be in the St. Paul area this weekend, be sure to stop by the Lee's Speed Shop booth and say hello. "The beauty of the cross is that in offering Himself as a propitiation, Christ satisfies the holiness of God, the justice of God, the love of God, the mercy of God, and the wrath of God. ALL of it, there." I say, well put Sir Brass! That kind of puts bike shows and such in proper perspective. I am not normally one to call out others for their misstatements unless I feel I am on pretty firm ground. In fact, I much prefer to confine myself to presenting something as absolutely true only when I can back it up from the Bible. Well, I am well enough acquainted with the Bible to state with assurance that scripture does NOT address velocity in a Screamin' Eagle 110 head. In fact, contrary to some contemporary thought, Harleys are not mentioned at all! But, with that in mind, I have received a couple inquiries lately having to do with the velocity (or more accurately the lack of velocity) in the Screamin' Eagle 110 heads. Doing a quick Internet search turns up a lot of statements on various forums stating unequivocally that the ports in a SE 110 head are too large, resulting in a lack of velocity which kills power. I believe this to be incorrect. Here is something you hear a lot in the performance world. "CFM sells heads, but velocity is what makes power." "We port heads for maximum velocity, not flow numbers." So, what is the basis for that statement? The effect which is often referred to as inertia tuning is based on this; a moving column of air (such as in your intake port) has inertia which will continue to fill the cylinder after the piston has reached Bottom Dead Center on the intake stroke. In case you are a little fuzzy on your 4 stroke theory, as the pistons goes down in the cylinder on the intake stroke, it creates a lower than atmospheric pressure area which "draws" the fuel air mixture in past the open intake valve. One might think that once the piston reaches BDC there would be as much "charge" in the cylinder as there is going to be, however the column of air in the intake system has inertia which causes it to keep adding the fuel air mixture even though the piston has now started to rise in the cylinder. For this reason, performance camshafts do not close the intake valve entirely until well past BDC. For instance, a cam that I have used in SE 110 engines in the past is the Wild Things TC4 which does not close the intake valve until 54 degrees after BDC. Now, thinking back to your high school physics class (or in my case thinking back to when I could remember that far back), inertia is a function of mass and velocity. The more mass and the more velocity something has, the higher the inertia. For instance, if someone tosses a baseball to you at a speed of 20 mph, it is unlikely to cause you any discomfort to catch it, but have a professional pitcher throw you the same weight ball to you at 98 mph, and ....ouch! The same holds true in the intake system. There is a certain amount of mass to the fuel air mixture and if you can add velocity to that mass, it will have more inertia, thus filling the cylinder more in those last few moments before the valve closes. Likewise, velocity in a port is a function of two factors; flow (measured in Cubic Feet per Minute) and Cross Sectional Area. If the CFM goes up and the CSA stays the same, then velocity has increased. But, of course if the CSA goes up, and the CFM does not, then velocity decreases. This, of course, is what the critics of the SE 110 heads are saying: the velocity is too low because the port is too big. But is it? Most good flow bench programs (I use and recommend Port Flow Analyzer from Performance Trends) will have provision to give a port velocity readout based on the port's average Cross Sectional Area. In order for this to be accurate one needs to have measurements of both the length of the port and the volume of the port, both of which are reasonably easy to perform. At a test pressure of 28", a stock '06 and later Twin Cam intake port has a velocity of 264.2 Feet Per Second at a valve lift of .550". My best porting job on that casting yields 280.7 FPS at the same lift. As with 99.8% of ported heads, that head has a larger port volume than stock. The reason the velocity is higher in the ported head, is because the CFM increase was much greater than the CSA increase. Now, comparing these two heads to one of my ported SE 110 heads, we see that the velocity in the SE head is 278.4 FPS at that same test pressure and lift. Very close to the ported stock head. It seems that I have managed to show that at least my ported Screamin' Eagle 110 heads do NOT have a velocity problem as some suggest, at least based on actual flow figures and port size measurements. So, if you are really concerned about low velocity in your SE 110 heads, then maybe the solution is to send them to me for porting work. If you are wondering why I don't have velocity measurements listed for unported SE 110 heads, I would answer that I wonder why you would run unported heads if you are concerned with performance? Even at that, though, how important is velocity in a Harley head? Remember what we discussed about the relationship between mass and inertia? Velocity by itself does nothing if there is not enough mass involved to give you some inertia (a ping pong ball at 98 mph might sting a little, but nothing like that baseball!). The problem with striving for high velocity ports in a Harley, is that the ports are so short, the mass contained therein will never be enough to provide much inertia, and without inertia ....well you may as well be throwing a ping pong ball. I would suggest that many of those promoting high velocity Harley ports are mis-applying knowledge gained from small block Chevys with their loooong ports. That is not to say that inertia plays no part, just that it is not as significant as when dealing with a longer port. "An engines induction system is almost un-tunable until it hits 6500rpm and until it hits 6500 you have to make allowances.. At 6500-6800 rpm you can build wave propagation and inertia in the system to attain higher VEs. Below that, forget it. The entire scope and design of the induction system changes when your building engines below 6500rpm." ...... "Low RPM engines don't obey the same rules. If you try and build them the same way you do a high rpm application you will be leaving a lot of power on the table." Folks, if you have a Harley, when Darin says low RPM engines, he is talking about yours! So to sum up: Would the ports on a Screamin' Eagle 110 head be better if they were smaller? Sure, if you didn't loose any flow. Is it worth the time and expense to weld them up and rework them? I certainly wouldn't spend my money there. The improvement would, I think, prove to be so small as to be negligible (we are talking about a street motor here, aren't we?). Besides, if you wanted to improve something on the SE110 heads (besides through normal porting work), it would be the goofy way the spark plug protrudes into the chamber which causes issues with the wet flow, .... but that would be a subject for a another post.